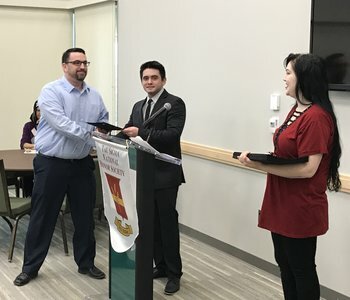 The WSU Eta XI chapter of the Tau Sigma National Honor Society officially welcomed 128 inaugural members during an induction ceremony Feb. 28. Eta XI is the 180th chapter of Tau Sigma. Eta Xi President Ali Kahil, a senior majoring in history, told the students that they should feel honored and proud to be among the inaugural members of the honor society. Tau Sigma fulfilled a vision from Doug Freed, director of WSU’s Transfer Student Success Center (TSSC). “We had a dream,” he said. 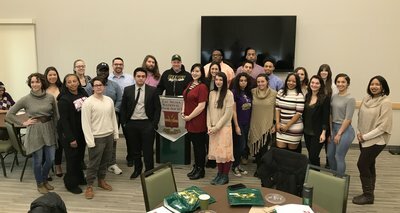 “The dream was to have a way for current, high-achieving transfer students to be able to get together and engage with each other. In researching ways to do this, it became apparent that having a Tau Sigma chapter was one of the best methods to achieve our dream,” he said. The 30 inductees in attendance were called recognized individually, receiving a membership certificate and posing for pictures with Kahil. Gain leadership experience in the chapter and community. Tau Sigma members also can earn scholarships and attend leadership conferences. To be eligible, transfer students must have completed one semester at Wayne State and have earned at least a 3.5 GPA. Membership invitations are sent out in September and January. Irvin D. Reid Honors College Coordinator Drew Moser and TSSC Manager Jo Bains are the advisors for the group. “I feel like this is an excellent opportunity for transfer students to come in and really find a group they can connect with that shares similar experiences,” Moser said. For more details about Tau Sigma, stop by the Honors College in 2100 Adamany Undergraduate Library and ask for Moser, or visit Bains in the TSSC in 3101 Maccabees (5057 Woodward).